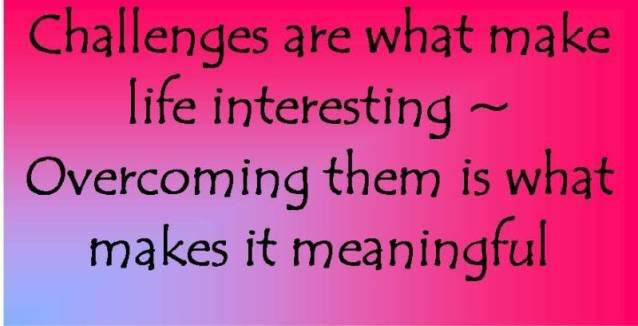 Life is never completely without its challenges. 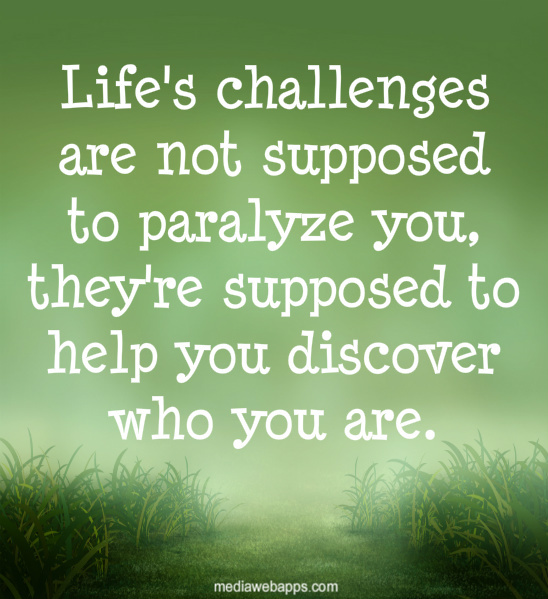 Recovery challenges everything we 'knew to be true'. The status quo is never news, only challenges to it. Every movie has its own unique series of challenges. Every movie has its complexities and its challenges. Don't wish for less challenges, wish for more wisdom. 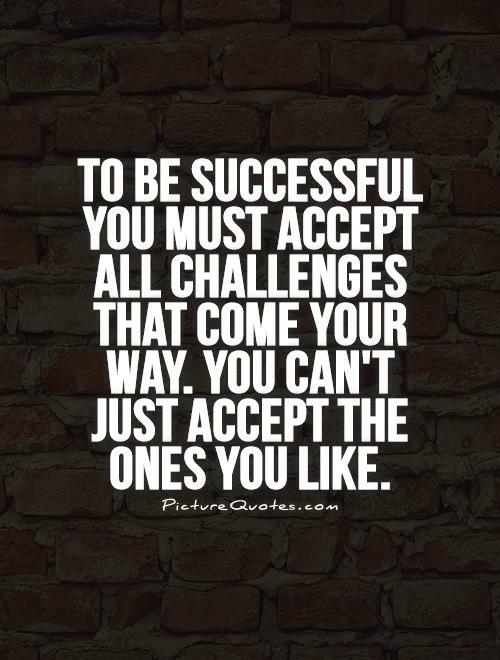 As an actor, you should be willing to take challenges. 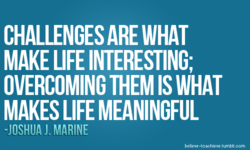 What makes life interesting are the challenges we face. Even challenges are beautiful opportunities in disguise. Injury taught me I need to learn how to face challenges. There is no military solution to the challenges of Syria. Whenever I see something that challenges me, I take it on. 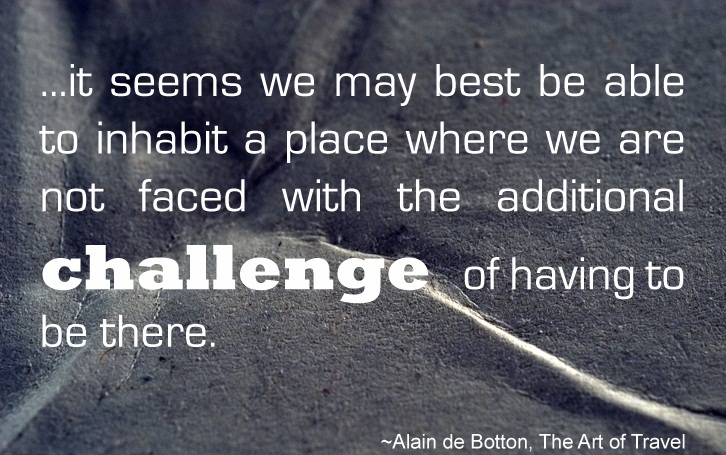 I always conceive a piece as a different set of challenges. ..Critically intervene in a way that challenges and changes. 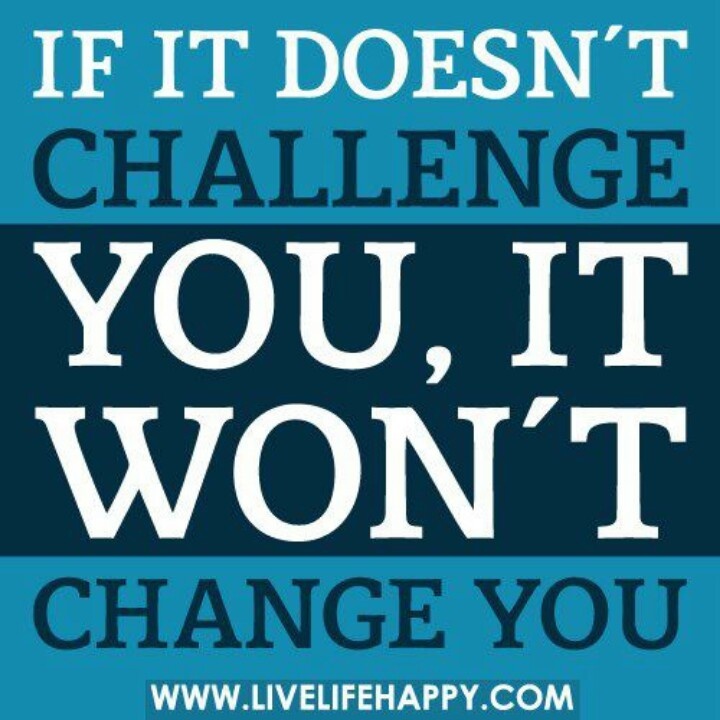 Without challenges, there would be no opportunity to evolve. Obstacles are challenges for winners and excuses for losers. 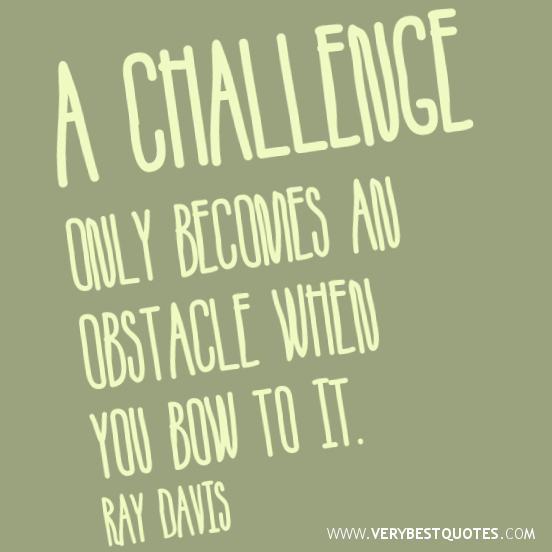 I love challenges and hurdles because they are opportunities. Blessings come in disguise. 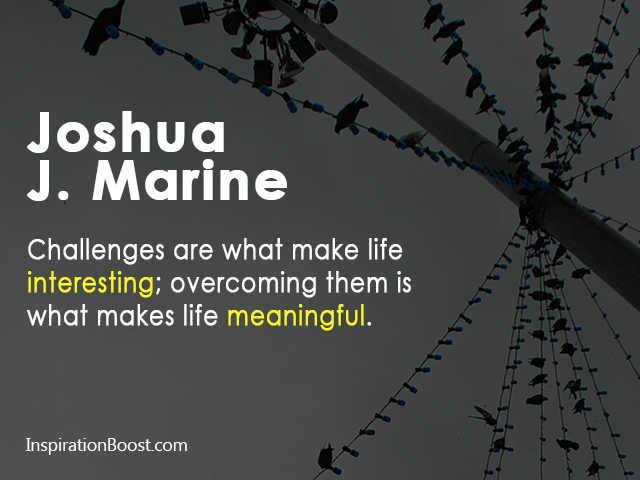 And challenges can be a blessing. Every role that you play comes with its own set of challenges. 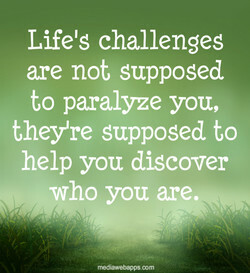 All of my past challenges have helped me become who I am today. Anyone who attempts to build great things will face challenges. I honesty feel that each film has its own particular challenges. 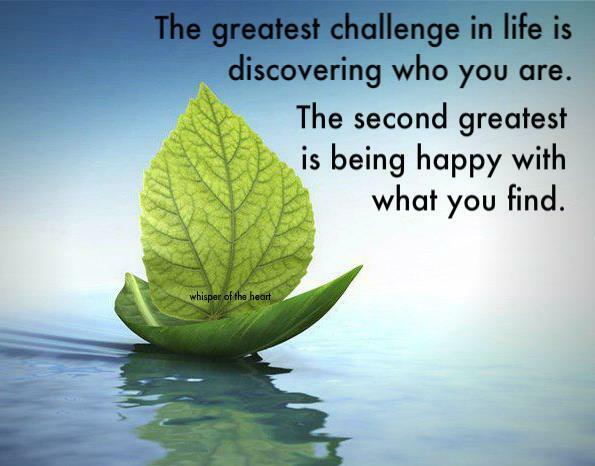 Examine the opportunities, the challenges you've given yourself. One of the great challenges is to know when things are not right. I think, men and women are different. 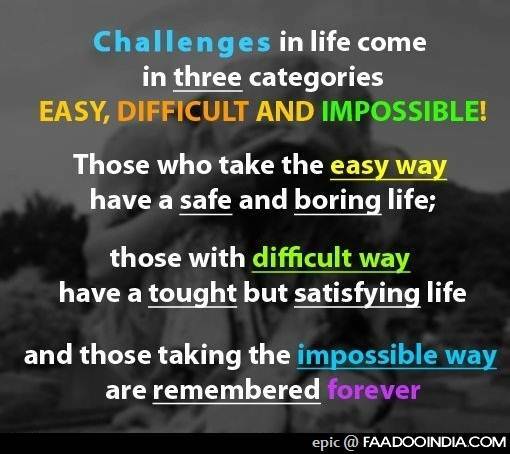 We have different challenges. Life is a lot more fun if you treat its challenges in creative ways. I like challenges in life and pushing myself out of my comfort zone. While raising my children, I would like to take on other challenges. Leaders today face challenges for which they are utterly unprepared. There will be many challenges ahead, and I'm looking forward to them. 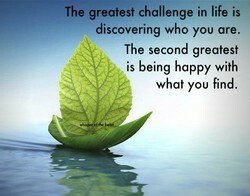 Only by seeking challenges can we hope to find the best in ourselves. 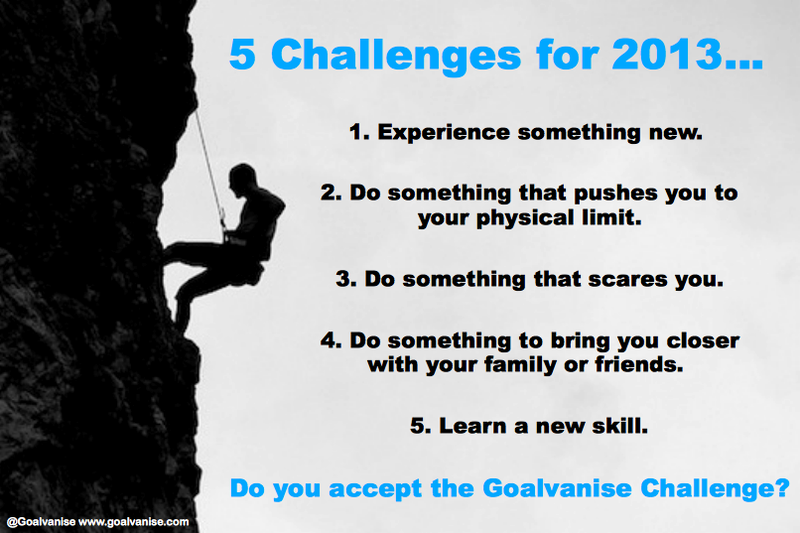 It's important to set challenges that you're not sure you're equal to. Each year represents new challenges and obstacles. You have to adjust. We cannot meet 21st Century challenges with a 20th Century bureaucracy. 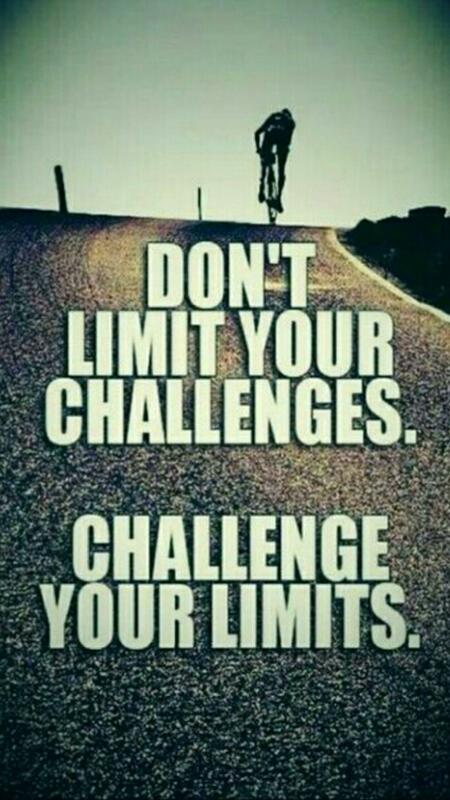 Give your best to the challenges. 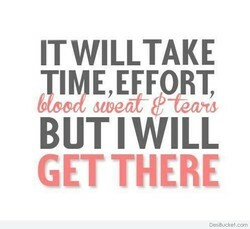 And what you get will be even better. Access to capital is one of biggest challenges for businesses in Africa. Sometimes being in control of everything comes with a lot of challenges. 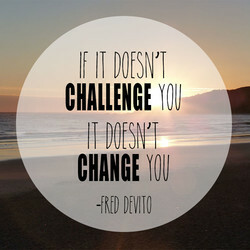 I like challenges and I definitely would like to be more of a chameleon. One of the challenges of the movie is there are no apologies or excuses. Yesterday's corporations visibly cannot meet today's economic challenges. I am confident that we will meet whatever challenges the future may bring. People won't give their best unless their leader challenges them to do so. We are a nation that seeks out solutions and refuses to ignore challenges. Go forward, knowing that you are greater than the challenges of your time. We mistrust anything that too strongly challenges our ideal of mediocrity. Life is meant to be a challenge, because challenges are what make you grow. Art should help you to navigate the real challenges of being a human being. Water is the key to dealing with the twin challenges of poverty and growth. Good does not triumph unless good people rise to the challenges around them. 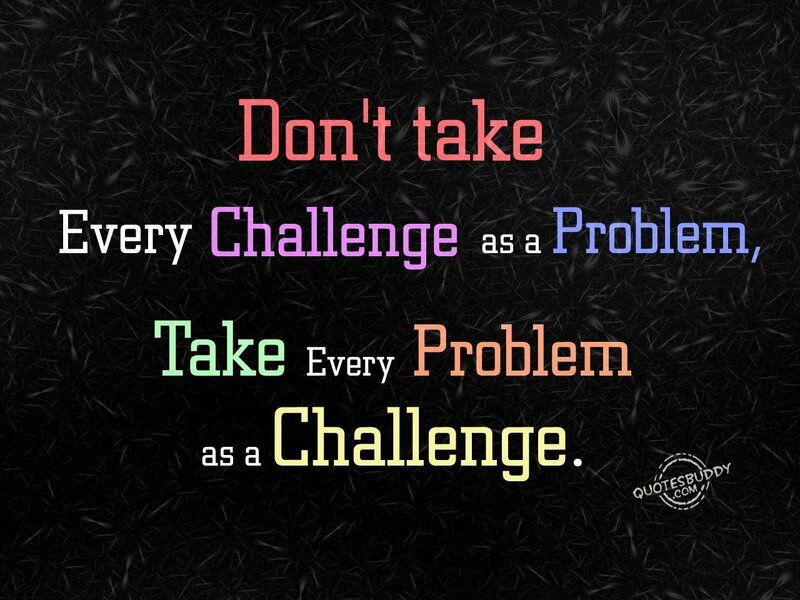 I welcome challenges. I like challenges. 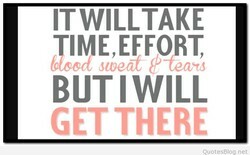 It gives me a reason to keep going. The Samurai always has to rise and move on, because new challenges will come. 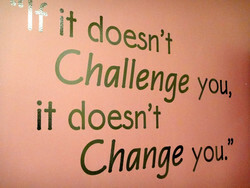 I like the challenges of doing different things. It keeps things fresh for me. The faithfulness of God in the past fortifies believers for future challenges. 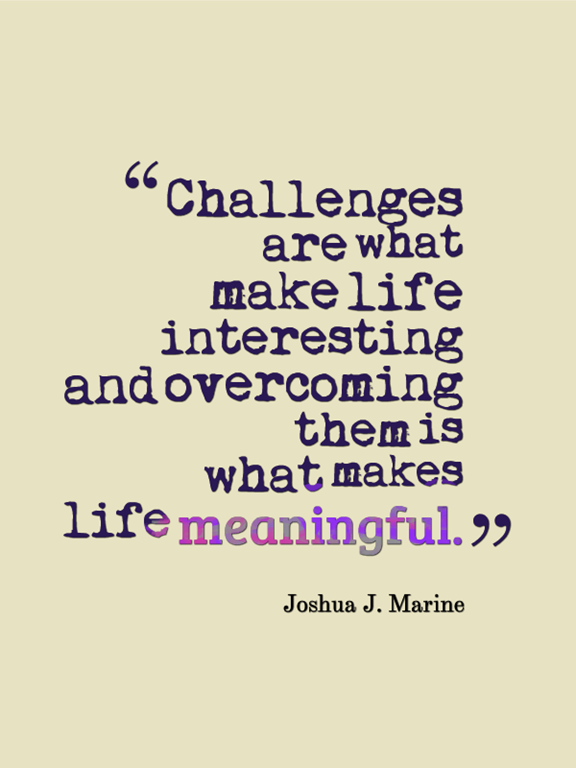 The challenges we face are never as important as the challenges we face up to. We need a great president who can lead us through the great challenges we face. My perspective has blossomed. 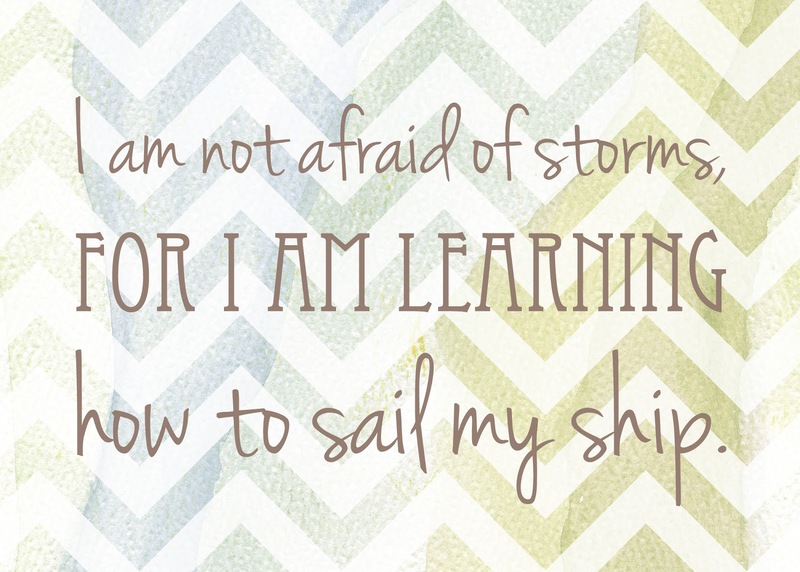 There's always more to learn and more challenges. 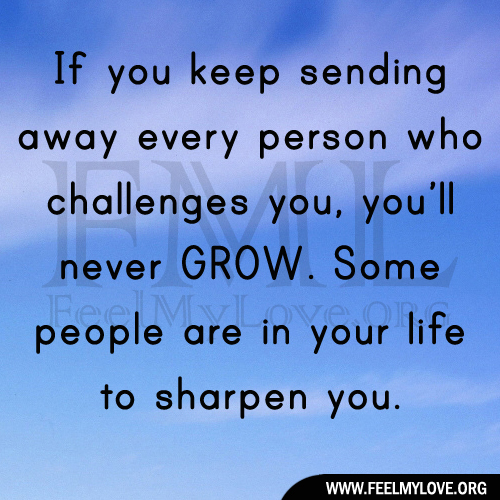 The challenges we face in life are always lessons that serve our soul's growth. 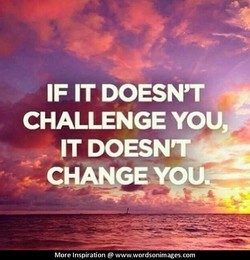 I always think challenges are interesting and help you to become a better person. We have become accustomed to living our life with joy amidst pain and challenges. 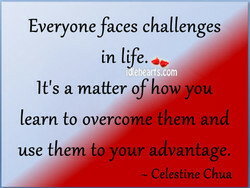 Everyone is going to face challenges. What defines you is how you overcome those. To some, challenges are exhausting. To others, they are opportunities in waiting. 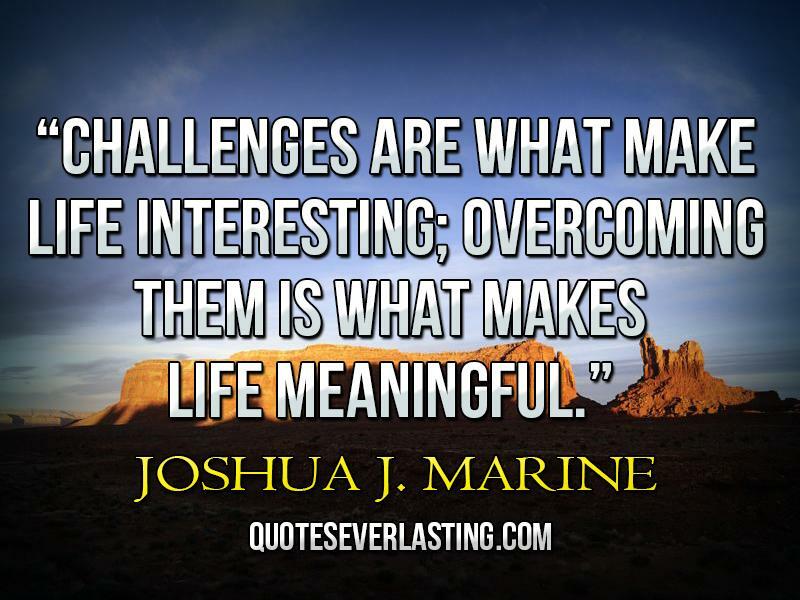 There are no great men, only ordinary men, who have met extraordinary challenges. Life is all about finding challenges for yourself that you want to try to achieve. 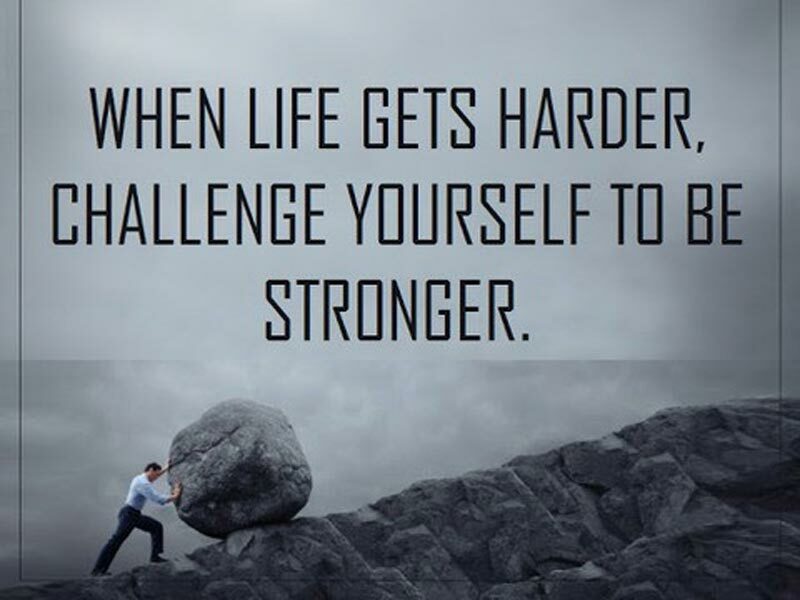 Every day has its own challenges, and every day those challenges make us stronger. God never leaves us alone, never leaves us unaided in the challenges that we face. I've had many challenges - every entrepreneur does - it's the nature of the beast. Without challenges we would literally wither and die (which also would be perfect). At Microsoft, the magic of software is used to take on very interesting challenges. There are always challenges with books , deciding what to include and what to omit. Human consciousness becomes a terrible gift which challenges the power that gave it. Jesus came to save us, not just from politics, enemies, challenges, or difficulties. Every project has its own challenges and rewards. 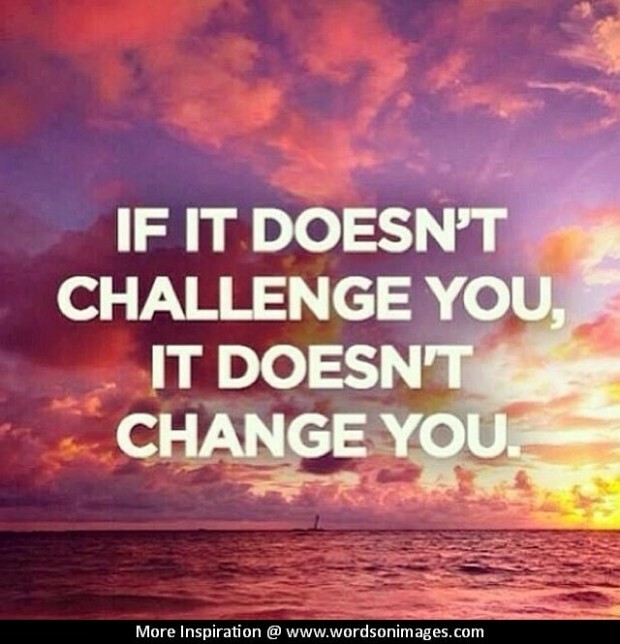 If it's not challenging, why do it? The ability to find solutions to life's challenges is what makes us grow as a person. Great is the rose That challenges the crypt, And quotes milleniums Against the grave. The challenges African-Americans are facing today are rooted in the system of slavery. For "I" to become "we" and yet remain "I," is one of the great challenges of marriage. 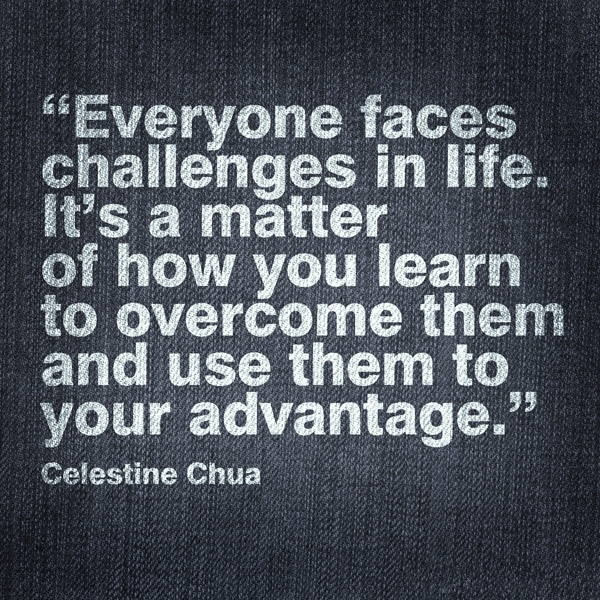 Everyone has challenges and lessons to learn - we wouldn't be who we are without them. There's a personal side to me of challenges as an actor that I like to take on myself. 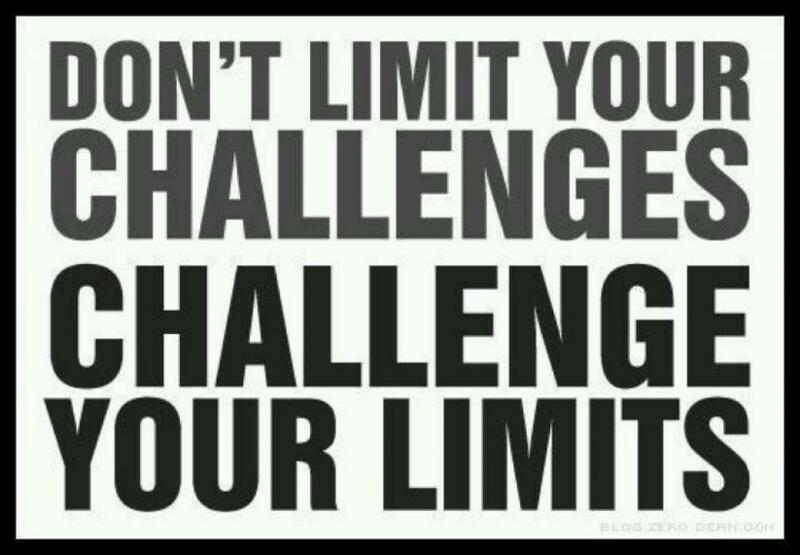 Don't limit your challenges - challenge your limits. Don't spread patriotism too thin. I always had challenges when I was younger, because I looked so young but sounded older. Businessmen need to understand the challenges of society and contribute to solving them. One of the challenges of wearing so many hats, is that I love each and every one of them! Permaculture challenges what we're doing and thinking - and to that extent it's sedition. Challenge is what makes men. It will be the end when men stop looking for new challenges. She wins who calls herself beautiful and challenges the world to change to truly see her. Of course, any job is scary, but you tackle the challenges head on and hope for the best. 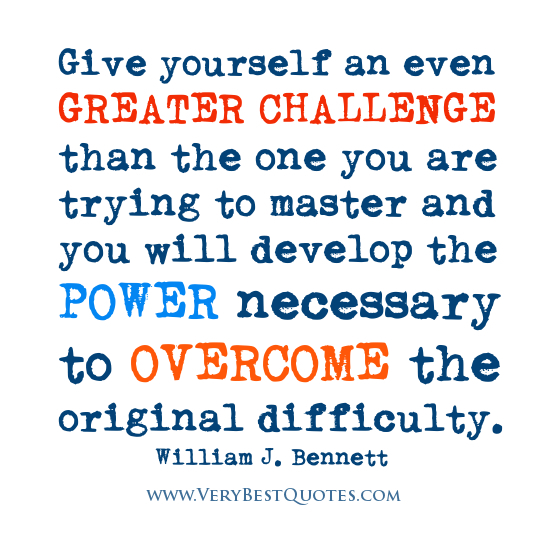 I deeply believe in one's own positive will to overcome even the most daunting challenges. Having a dream is what keeps you alive. 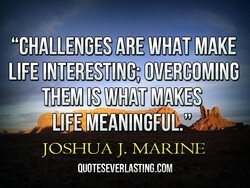 Overcoming the challenges makes life worth living. 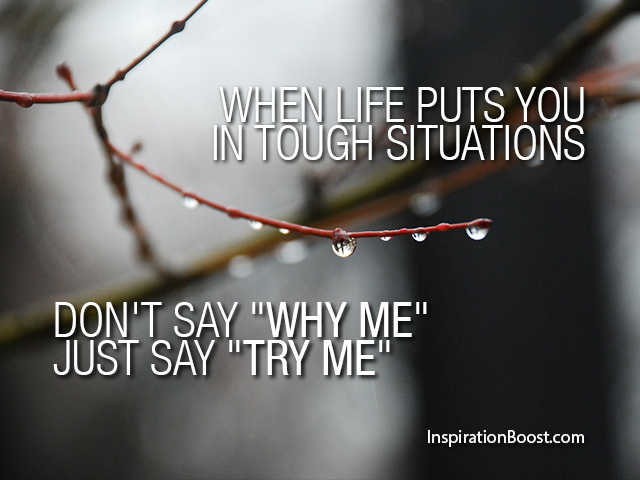 I tend to attack the challenges that are right in front of me, the ones that I have today. 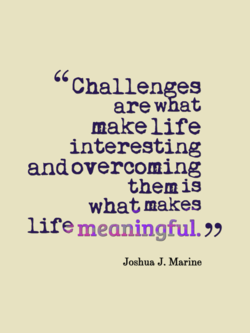 I believe that challenges can push us beyond what we might otherwise be able to accomplish. Our province needs united leadership and shared purpose in tackling the challenges we face. 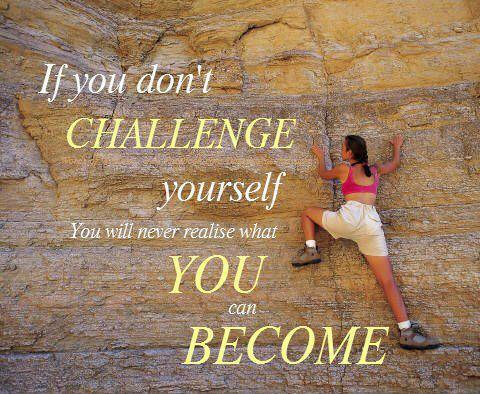 I do a lot of challenges I run marathons and stuff like that and I like to challenge myself. Some of the biggest challenges were, page after page, standing naked in front of the reader. When it comes to the challenges of the actual process, I soldier on as best I can, on my own. 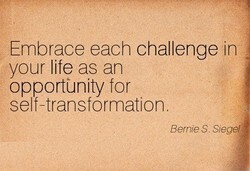 Do battle with the challenges of your present, and you will unlock the prizes of your future. Sometimes the darkest challenges, the most difficult lessons, hold the greatest gems of light. Often the biggest obstacle in meeting lifeâs challenges is actually our own fear of failure. I cannot live without art: it excites me, it challenges me, and it leads me to the next thing. 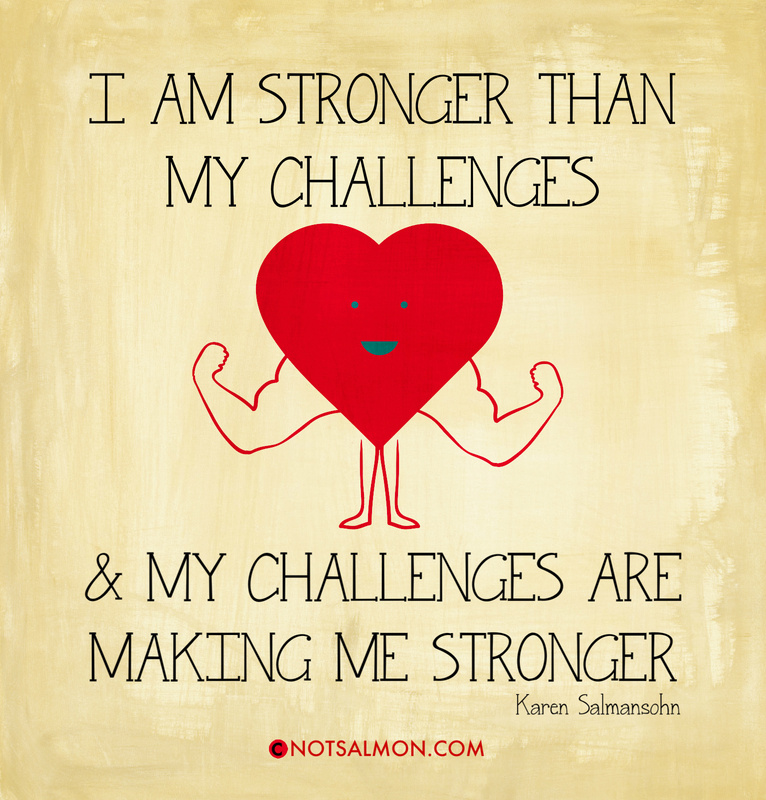 By facing our challenges and overcoming them, we grow stronger, wiser, and more compassionate. I've had so many challenges throughout my career, however successful people perceive me to be. I think the challenges should be familiar. They should have some relationship to the feelings. 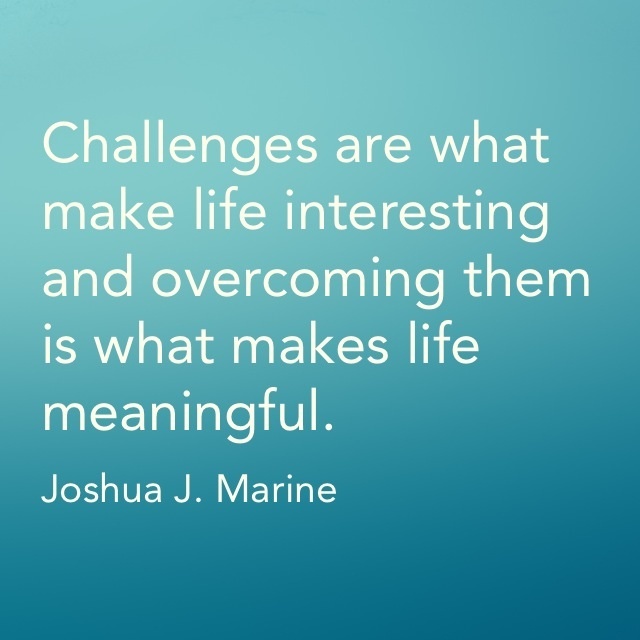 You have to meet all of the challenges, big and small. Because how you start is how you finish. 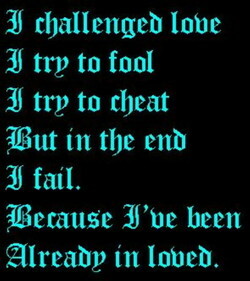 Love lasts because it changes and not because it stays the same and never faces any challenges. With each film, i need an artistic challenge so I don't get bored! I like to tackle challenges. One of the challenges, I think, is that Americans are not sufficiently vested in foreign policy. I hope my visual language inspires others to tell their stories and challenges people's thinking. Like all actors, I was open to taking on new challenges, including those outside my comfort zone. Originality is dangerous. It challenges, questions, overturns assumptions, unsettles moral codes. I think one of the big challenges about science fiction is finding truth to relate to as an actor. Throughout my chess career I sought out new challenges, looking for things no one had done before. 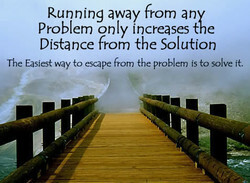 Once we become aware of our issues and challenges, we become accountable to do something about it. Turn your 'problems' into 'challenges' and you will suddenly see results in a more positive light. 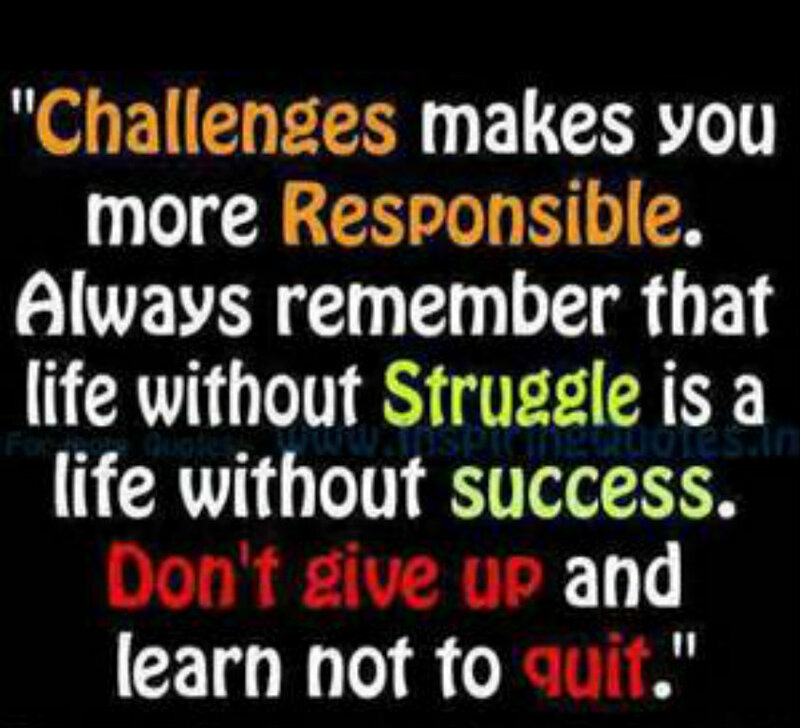 Success is usually earned by persevering and not becoming discouraged when we encounter challenges. If a young woman is looking at the landscape of Hollywood, what she sees is almost only challenges. Dream big by setting yourself seemingly impossible challenges. You then have to catch up with them. Global climate change is one of the greatest challenges facing humanity in the twenty-first century. I want to be the voice of change and hope. I want to confront the big challenges this country faces. I like to try all kinds of styles so it always challenges me and forces me to try to look different. I do think Brexit vote speaks to the ongoing changes and challenges that are raised by globalisation. You can't buy peace by just wishing it and avoiding the challenges that other nations present to you. Each film is difficult, in its own particular way. There's a unique set of challenges on every movie. If you refuse to be happy until you have no problems or challenges, you will probably never be happy! 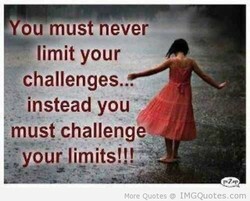 Your present challenges or limitations cannot stop you from becoming what God has ordained you to be. I love challenges. If you don't have any and can do whatever you want. Then it's probably time to die. There will be no more 'them and us', only us, sharing struggles and challenges as part of being human. We're talking about a being whose very existence challenges our own sense of priority in the universe. He's stepping up to challenge me. Anybody that challenges me, has got to get dogged out. That's my job. 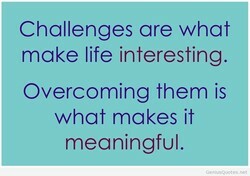 Those periods of struggling to overcome challenges are what people find to be the most enjoyable times. 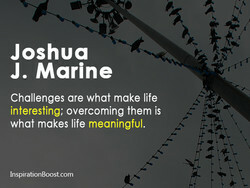 The challenges in our lives are there to STRENGTHEN our CONVICTIONS. They are NOT there to run us over. 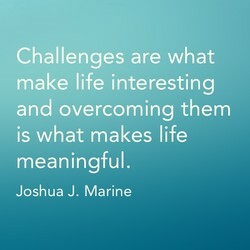 I think sometimes in life the biggest challenges end up being the best things that happen in your life. To break our addiction to oil is one of the greatest challenges that our generation will have to master. Thats one of the challenges of investing in China, is the lack of clarity with respect to tax positions. That's one of the central challenges we face - how to stay true to events and compress the fundamentals. Inexperience because of (President Barack) Obama's inexperience.Look that would be one of the challenges. Flow occurs in your life when your highest skills are matched to challenges that quite exactly meet them. Until the day we die our brain remains capable of change, according to the challenges that we set for it. I live for challenges. In my career, all I want to do is try to challenge myself and have a varied career. 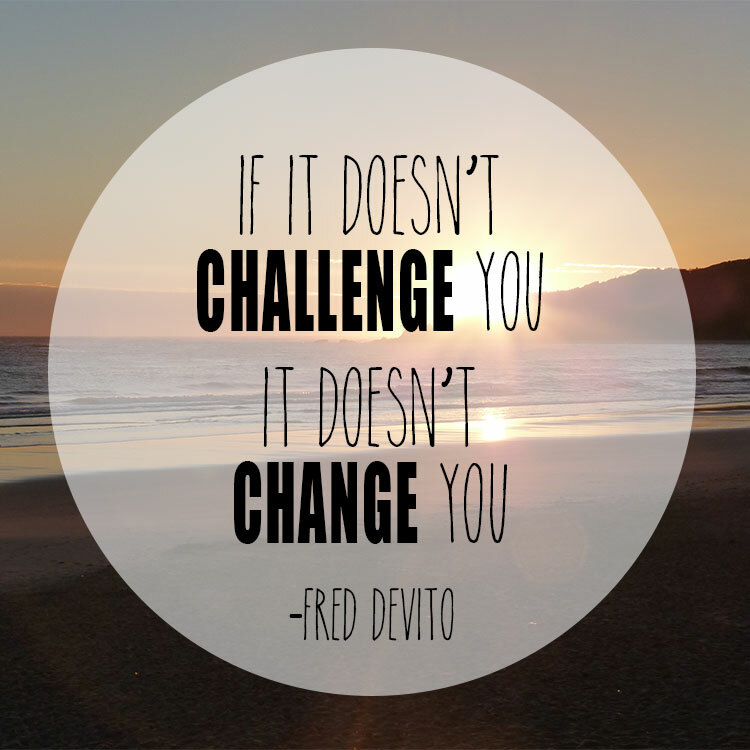 Good fiction challenges us as much as it entertains and these days, we could do with both of these things. I spend my life essentially alone at a computer. That doesn't change. 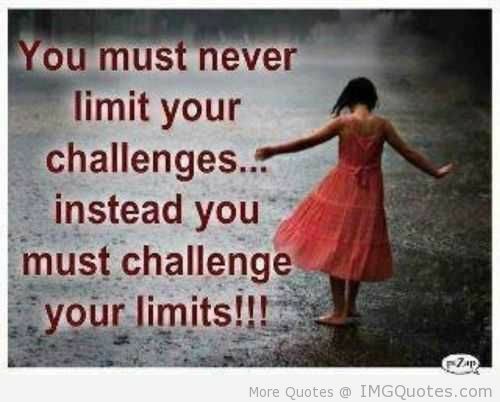 I have the same challenges every day. Every day in life there are challenges; whether you're an accountant, a race car driver or whatever you do. Don't put your characters on a treadmill. They need to go new places, face new challenges and do new things. The Iranian people are getting restive because of the challenges that sanctions have posed to their economy. I was made to be where I'm at. 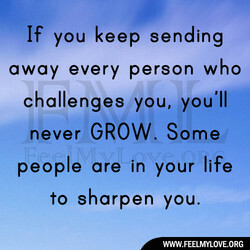 I just had to go through some challenges, so that I can educate others later. God has created us to be dependent upon Him, to bring Him our challenges and allow Him to help us with them. You go into flow when your highest strengths are deployed to meet the highest challenges that come your way. 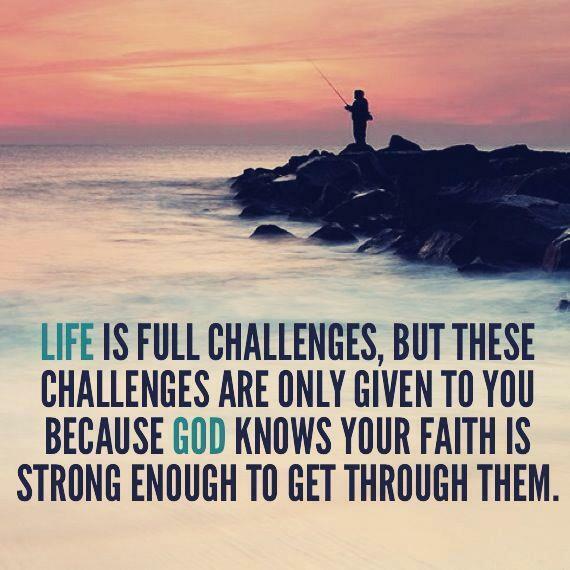 It is sometimes easier to trust God in a life-threatening battle than in the small challenges of daily life. 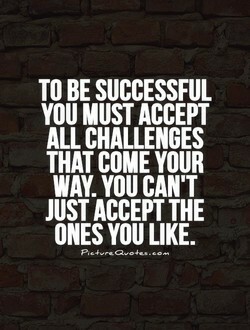 To be successful you must accept all challenges that come your way. You can't just accept the ones you like. A surprise trigonometry quiz that everyone in class fails? Must be in the Lord's plan to give us challenges. Now is the time for all of us to take our share of responsibility for a global response to global challenges. 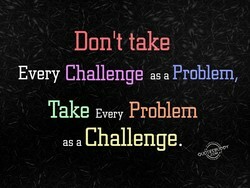 So one could say that the only real problem is dysfunctional thinking, the rest are challenges, not problems. Here's one of the great challenges of life. Being happy with what you have while in pursuit of what you want. I felt that if others can overcome incredible challenges to be in shape, why would my story be any different? I have a tendency to pick up my own challenges. The more difficult something it is, the more I want to try it. He who challenges the God in his dying bed is indisputably the most courageous man, but not the cleverest one! 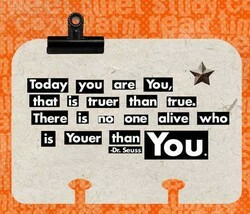 .. a friend is someone who inspires, who challenges, who sends you in search of some truer sense of yourself.. 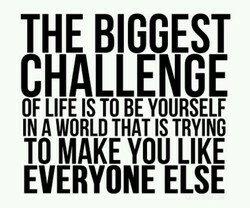 I think our insecurities are our biggest challenges, and we all have them. Trust me, I've got plenty of my own. I feel many, many challenges in my career but I try not to obsess about them. I deal with them, but not obsess. ... for every disability you have, you are blessed with more than enough abilities to overcome your challenges. Life is always full of drama and challenges, but you don't have to overreact to any of it if you choose not to. 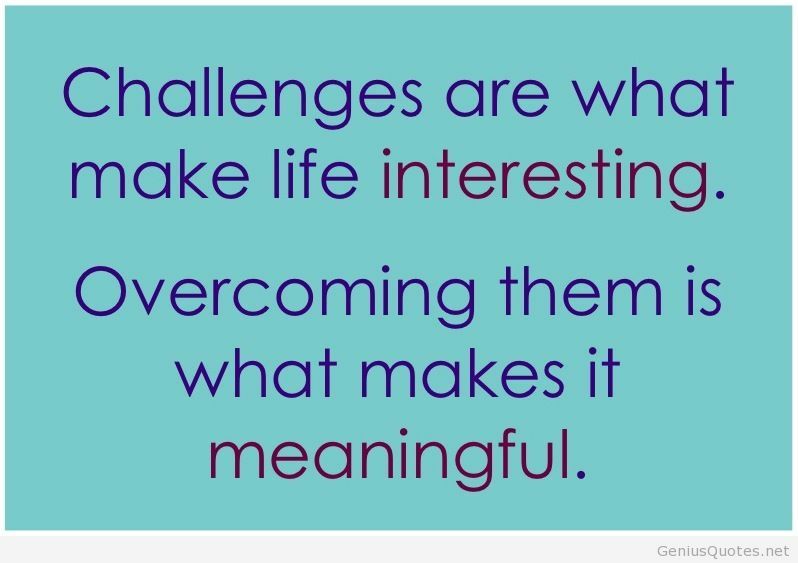 What makes things exciting in life is to overcome your challenges and get creative and think outside of the box. Most parliamentarians don't have a clue as regards the challenges or the opportunities the games industry faces. I'm not silly. 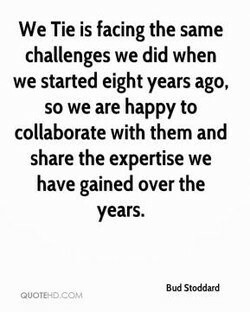 I understand that, with age and at different parts of your career, you have different challenges. My problem with most athletic challenges is training. I'm lazy and find that workouts cut into my drinking time. I need something different [roles], always something just slightly different, that pushes you and challenges you. Through a forest of challenges, thought moves and squirms, resisting beguilements; if it endures, it emerges pure. One of the challenges we set up for 'Puscifer' was to come up with a core identity and see how far we can push it. Every film is difficult. Making films, you're always going to have problems, there's always going to be challenges. 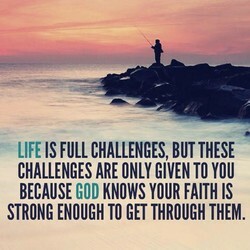 Your life will always be filled with challenges. 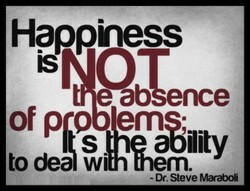 It's best to admit this to yourself and decide to be happy anyway. The idea of an entrepreneur is really thinking out of the box and taking risks and stepping up to major challenges. 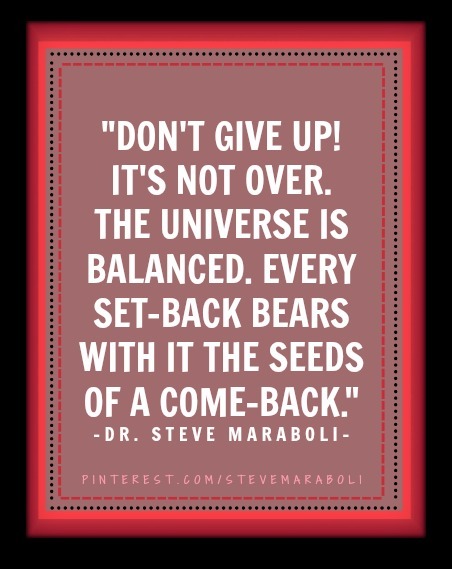 There may be challenges or crosses that may have delayed your goals temporarily, but now it's time to move forward. I think the challenges that come with the responsibility of art directing something is something that appeals to me. 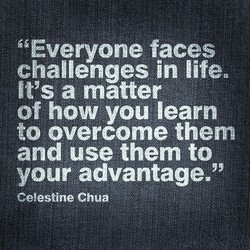 Every person faces their own unique challenges and you may not always know what others around you are going through. It's the character that is the strongest that God gives the most challenges to. Take your struggles as a compliment. We are at a stage in history in which remolding society is one of the great challenges facing all of us in the West. The Compound Effect will help you beat the competition, rise above your challenges, and create the life you deserve! 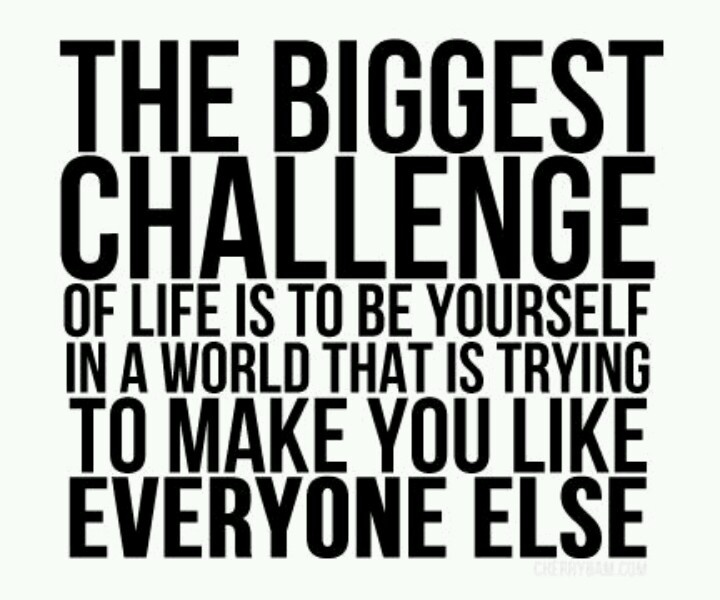 Everybody has their challenges; I couldnt say that we have more challenges than other people, theyre just different. I love telling stories. I like the challenges presented to me on a daily basis. There's nothing resting about acting. In business, one of the challenges is making sure that your product is the easiest to experience and complete a sale. My interest in life comes from setting myself huge, apparently unachievable challenges and trying to rise above them. The development of the Internet has posed new challenges to national sovereignty, security and development interests. Obama said if elected his government would "harness technology to confront the biggest challenges that America faces". I don't have all the answers. I need your help, your guidance, and your leadership to tackle the challenges before us. When in doubt, just spit it out. That all challenges can be overcome by speaking the truth, no matter how itcomes out. Fiction challenges us and works its miracles by placing us in the skin of another human being and teaching us empathy. Ending poverty and ensuring sustainability are the defining challenges of our time. Energy is central to both of them. I discovered that Christianity does have the resources to meet the challenges posed by competing worldviews after all. 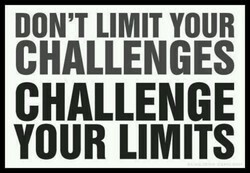 Don't limit your challenges; challenge your limits. Each day we must strive for constant and never ending improvement. I KNOW THAT I CAN'T SOLVE ALL THE MATERNAL HEALTH CHALLENGES IN THE WORLD BY MYSELF. I NEED AND WANT OTHERS TO JOIN ME. Each composer has their own language, and I try to meet the challenges, even if at first sight, they appear impossible. I thrive on challenges, and there is no more imposing challenge for someone in my profession than winning an NBA title. 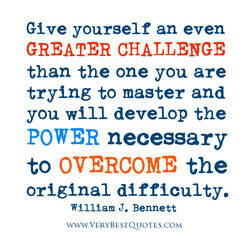 It's been one of the greatest challenges that ever came along in my life; it was one of the more difficult things to do. I really believe I'm no different from anyone else. I just had a few challenges I had to learn from at a very early age. 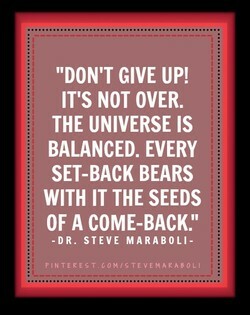 You know, its just a matter of working through the pitfalls sometimes and working through the challenges that lie ahead. I realized there was a better way to broadcast the news that empowered people to believe they could overcome challenges. Change is the nature of life but challenge is the future of life. 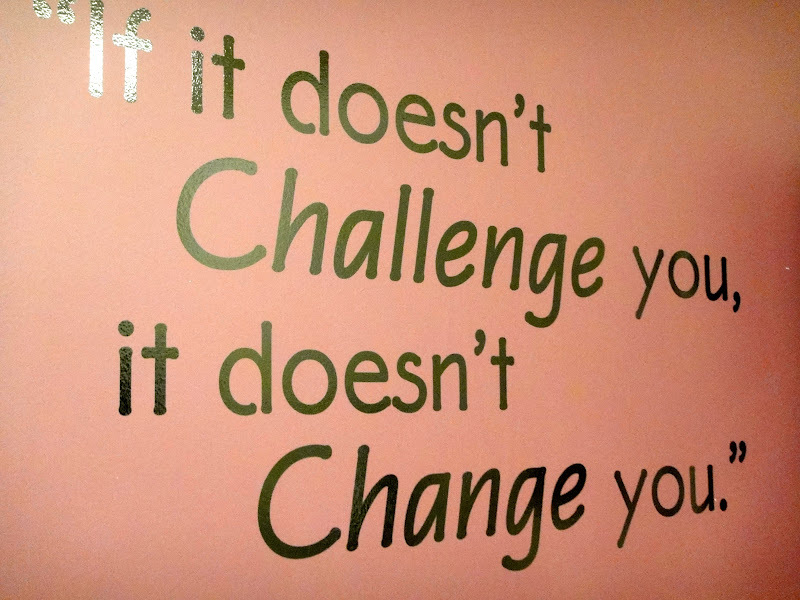 So challenge the changes. Never change the challenges..
Anger is a tool for change when it challenges us to become more of an expert on the self and less of an expert on others. Living is like training for an athletic event. 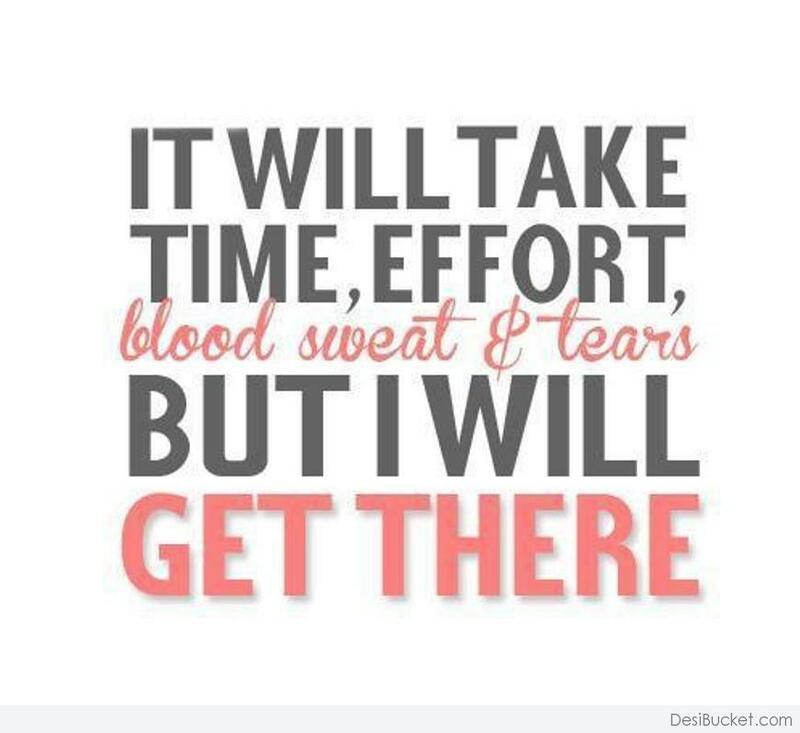 You have to have goals and challenges; you need to exercise and eat right. Know and understand that there will be challenges and difficult times. Don't try to avoid them. Welcome them. Gratefully. Of all the adventures and challenges that wait on the vagabonding road, the most difficult can be the act of coming home. Focusing on the Lord and everlasting life can help us not only at Christmas, but through all the challenges of mortality. Each job you have has it's own challenges. One of the great things about my job, is that each film is a different journey. Accepting your teen's individuality and natural evolution is one of the most difficult challenges you'll face as a parent. In America, one of our challenges, historically, is that we have very low voting rates, even during presidential elections. There are huge challenges ahead for this country but also huge opportunities. We can make this country stronger and fairer. Bob Beaudine challenges you to think differently. His unique approach to life and business has helped elevate many careers. "Oscillate Wildly" is in many ways a story of first love and how it challenges our hero's guarded sense of what's possible. I think I've proven I can build a team that plays a way of football that excites and challenges at the top end of the table. One of the many interesting challenges nature presents us is its apparent disinterest in maintaining the order humans crave. Be patient. Like storms, the challenges will pass. 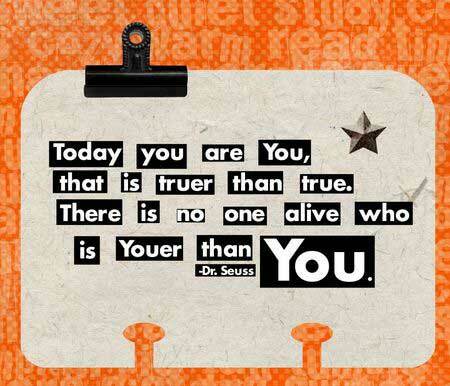 Know too, that like the sun, your true soul self is constantly radiating. 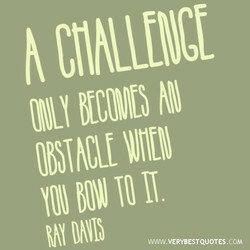 Challenges are opportunities for me to grow. 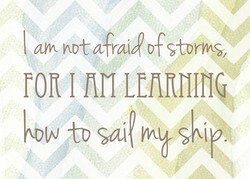 The more I learn, the more equipped I am to handle whatever situations come up. Life itself is always a trial. In training, you must test and polish yourself in order to face the great challenges of life. I demand a lot of myself. I want to learn. I can't sit back. 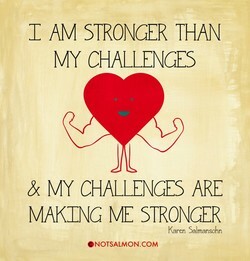 I like a challenge, so I create a lot of challenges for myself. When we align our lives with spiritual laws, challenges remain, but we can approach them with arms open wide, ready to dance. A challenge is always important; as an actor, as a human, it's good to face challenges and it's good to push your boundaries. When you have big dreams, you're going to have big challenges. If you were an average person you would have average problems. My life has always been a series of challenges and I'm psychologically-prepared but this is the biggest challenge of my life. It's critical that young people start flexing their creative muscles in order to take on the world's most complex challenges. Though our challenges are fearsome, so are our strengths. Americans have ever been a relentless, questioning, hopeful people. It's crucial with today's challenges that our children feel they have a source of information they can trust in their parents. 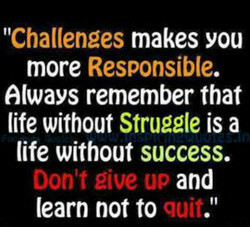 Everybody in this life has their challenges and difficulties. That is part of our mortal test. . . . Peace comes through hope. We are always faced with different challenges, and circumstances necessitate bringing out the greatness God puts in all of us. The real basic power of an individual isn't what he or she knows; it's the ability to think and learn and face new challenges. 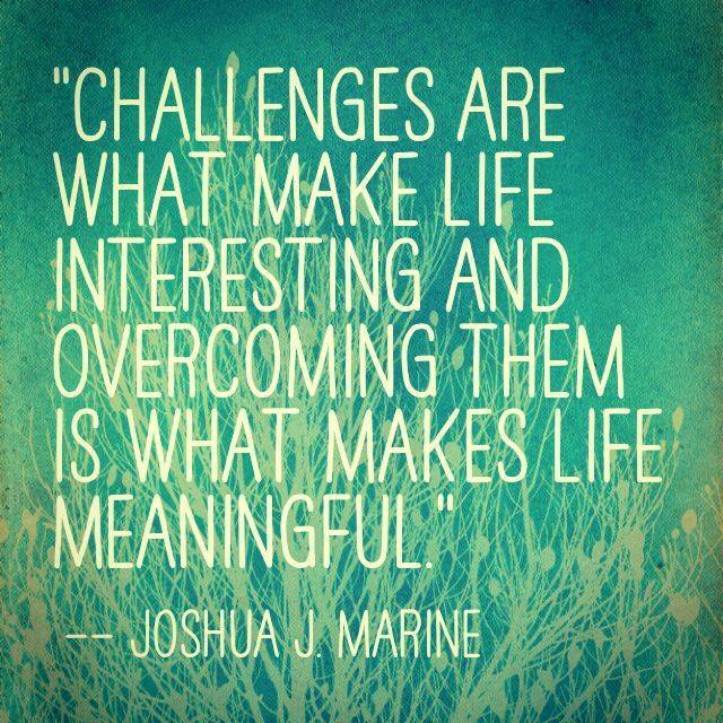 In order to do great things, you have to take on challenges in your life. 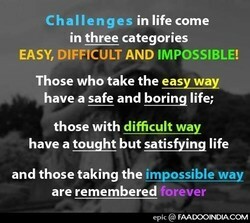 Im doing nothing but taking on different challenges. I'm going to deliver a detailed policy address on one of the greatest challenges facing our country today, illegal immigration. Asexuality does not make our lives any worse or any better, we just face a different set of challenges than most sexual people. If you don't step across the threshold of what you already know into the world of challenges, you never truly measure yourself. We might be too proud to admit it as guys, but we still need to learn how to manage responsibility, how to face our challenges. The flexibility we gain in asana is the living symbol of the suppleness we gain in relation to lifeâs problems and challenges. An educated child is better equipped to handle all the challenges of life, from finding work to avoiding diseases like HIV/AIDS. I don't really look for challenges as much as I like adventures. Other than that I'm just trying to find stories I want to tell. I'm just constantly trying to renew and give myself new challenges and push myself to uncomfortable places, trying to get better. The study of the human brain and its disease remains one of the greatest scientific and philosophical challenges ever undertaken. The nature of the presidency is that sometimes you don't choose which challenges come to your desk. You do decide how to respond. 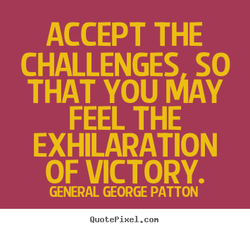 Accept the challenges of life and you'll continue to find that winning is the spirit of living . . . it's merely a state of mind. It's only by investing properly in our defense that we can ensure we're properly equipped to face our shared challenges together. Every work brings new and different challenges. Research is always helpful, regardless of whether the play is contemporary or not. The great challenges of life appear to us when, and only when, we have everything we need to survive and heal from the experience. I think that Sarah Palin really missed the chance to educate the public on what some of the challenges her son is actually facing. The challenges some European economies have are such that it makes it very difficult for them. You have to go where the growth is. Throughout our history, We Americans have been willing to meet great challenges and do what is right when our destiny demanded it. While each of us faces enormous challenges every day, it's not the sins we commit that will define us, its how we respond to them. Amateurs look for challenges; professionals look for easy trades. Losers get high from the action; the pros look for the best odds. As actors, we want to challenges ourselves and put ourselves in different situations to see how we react and deliver a performance. Selecting a challenge and meeting it creates a sense of self-empowerment that becomes the ground for further successful challenges. The poet and the politician have this in common: their greatness depends on the courage with which they face the challenges of life. I had an exciting, interesting childhood, to be sure, with all of the challenges that ghetto life provides - but had loving parents. My childhood had its challenges, like everyone's. It imbued me with certain things and took away others. It made me very determined. Global warming is not just the greatest environmental challenge facing our planet - it is one of our greatest challenges of any kind. I don't have any personal challenges about throwing away the past. If you're not changing, you're giving others a chance to catch up. When I was a kid I was very interested in the idea of the will, finding out what you're capable of. I liked those kind of challenges. 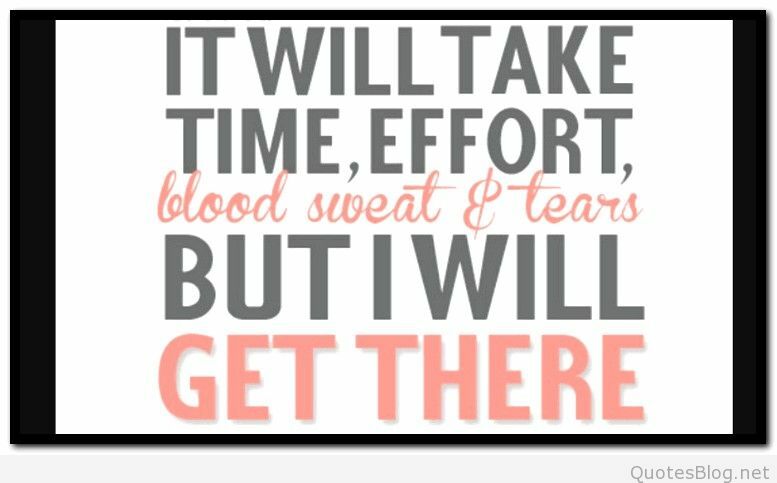 As runners we all have the same challenges and share the same experience, with the goal to accomplish something and better ourselves. One of our greatest challenges as Christians is to be driven by the love of Christ rather than constantly seeking after God's comfort. By helping us to be more productive, technology lets us to spend less time focusing on survival, and more on solving other challenges. 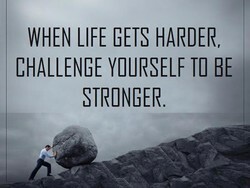 When you face difficult times, know that challenges are not sent to destroy you. They're sent to promote, increase and strengthen you. A character is defined by the kinds of challenges he cannot walk away from. And by those he has walked away from that cause him remorse. Perhaps, one of our greatest challenges as a nation, as a people, as human beings making sure that our grandkids can live on this Earth. The masculine in each of us struggles for greater freedom and tries to achieve it through financial, creative, or political challenges. I dont want someone else to go through and live through the life that I have had to live through in terms of the challenges that I face. A woman who is convinced that she deserves to accept only the best challenges herself to give the best. Then she is living phenomenally. Everyone faces challenges from the fierce competition as well as the manipulative crooks that are rampant throughout the music business. Perhaps we underestimated the challenges in Afghanistan in the past. That's why we are now strengthening and intensifying our commitment. 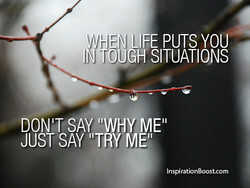 The challenges and how we deal with them: that's what defines us. 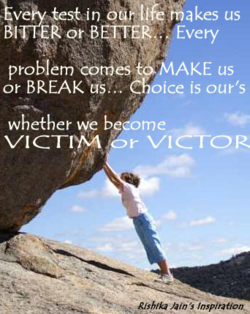 Problems don't define us; it's our ability to overcome and transform. If something is going to be better, it is new, and if it's new you are confronting problems and challenges you don't have references for. The best thing parents can do is to teach their children to love challenges, be intrigued by mistakes, enjoy effort, and keep on learning. Nothing's ever come easy to me and nothing ever will and that's okay. 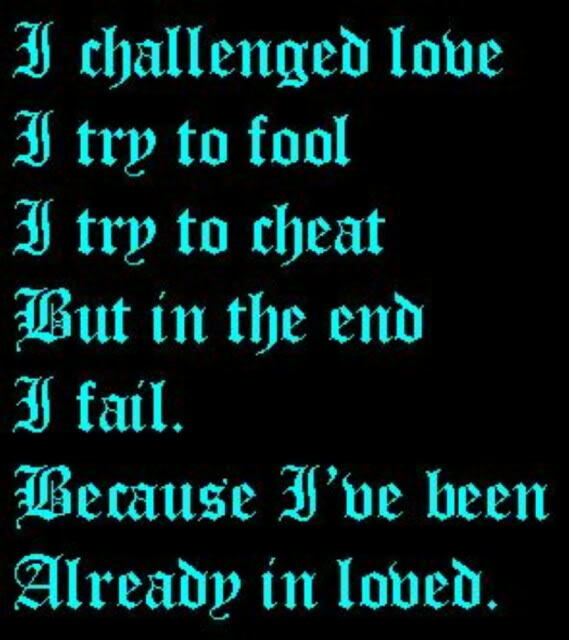 I'm used to that. 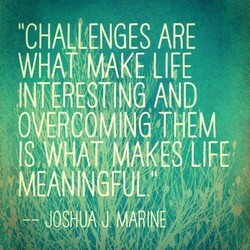 I go with the challenges. I roll with the punches. There are many examples of female leaders who are not afraid to take responsibility and openly face the challenges in the worst situations. 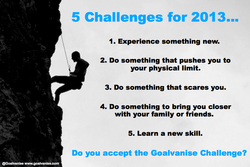 I look at what I have as a challenge and I could list a whole bunch of different challenges. And I choose not to be daunted by any of them. Every track has its challenges, but Suzuka is a continuous test of a drivers skills, and I think thats what makes it so beautiful to drive. Be patient with yourself and take heart. 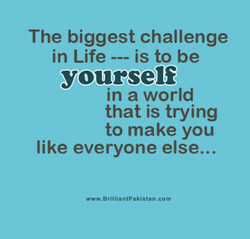 Your self-confidence will grow if you seek challenges and worry less about the initial insecurity. People with high assurance in their capabilities approach difficult tasks as challenges to be mastered rather than as threats to be avoided. Most extraordinary success includes first having to overcome extraordinary adversity. See your challenges as opportunities to become better. Being your best when your best is needed. 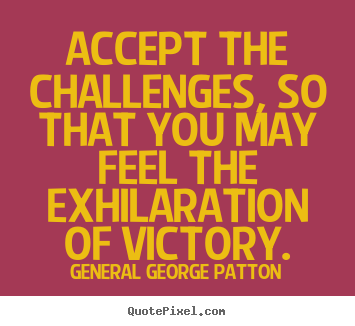 The ability to enjoy challenges when things become difficult and to derive exhilaration from them. Every book I've written has been different from the others, and each one seems to have its own timeline, requirements, and formal challenges. The dictionary also invites a playful reading. It challenges anyone to sit down with it in an idle moment. There are worse ways to kill time. When you follow God's will for your life, you can see how yesterday's events prepared you for today's challenges and tomorrow's opportunities. The historian does simply not come in to replenish the gaps of memory. He constantly challenges even those memories that have survived intact. In terms of the overall economy, we've got challenges and the big focus has got to be on recovery, on repair, and that's going to take a while. Donald Trump will lead a unified Republican government. And we will work hand-in- hand on a positive agenda to tackle America's big challenges. We believe that the elements in the chemical formula of our creative work, problem, invention, and art, correspond to the challenges of our age. A lot of [bureaucratic] rules were created a long time ago when there were different challenges, and they are now causing negative side effects. Few challenges facing America and the world are more urgent than combating climate change. The science is beyond dispute and the facts are clear. The challenges we've had personally and globally have been the catalysts needed to let go of old ways of being that aren't the vibration of love. Painters tend to ignore the challenges and thrills that sculptors enjoy daily - volume... like the perfect, imperfect voluminous oval of the egg. You're always going to face criticism, you're always going to face challenges, but those things are there to make you stronger and more committed. This is probably one of the most difficult challenges any parent could face - learning to love the other parent enough to make the children first. A smooth lecture... may be pleasant; a good teacher challenges, asks, irritates and maintains high standards - all that is generally not pleasant. My challenges have not been around music. My hardest thing in music was just sitting down and teaching myself how to play and believing in myself. We're all agreed that climate change is one of the greatest and most daunting challenges of our age. We have a moral imperative to act and act now. American Psalms challenges Christian patriots to put aside personal agendas, prejudices and partisanship, and pray for our leaders as God commands. I'm always interested in people being able to share stories that allow us to see the landscape of human foibles, challenges, and ultimately triumph. Depression is useful. It signals that you need to make changes in your life, it challenges your tendency to withdraw, it reminds you to take action. We all come to this planet as spiritual beings destined to experience a variety of challenges and situation in order to grow and evolve spiritually. If a young girl feels comfortable to pursue her passion, we as a collective will be stronger and more equipped to face the challenges life presents. We firmly believe in the power of unity and feel that it is easier to get pass hardships and challenges as a team. This gels us and keeps us strong. I can help someone grow their business 130% in 12 to 18 months only because I've done that with so many of my own and have faced so many challenges. Although the general security situation for the Beijing Olympics remains stable, we still face the challenges of terrorism, separatism and extremism.